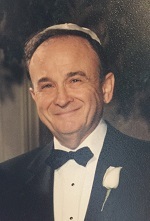 Norman "Buddy" M. Newman, 90, of Scottsdale, Arizona, formerly of Michigan, died on 02 December 2018. The Funeral was Private Family Graveside Service . Rabbi Michael Moskowitz officiated. Beloved father, grandfather, uncle, companion and friend, Norman M. (“Buddy”) Newman passed away peacefully on December 2, 2018 in Scottsdale, Arizona. Throughout his life, Buddy was active in community and local affairs. He was a member of the Dearborn Exchange Club, the Dearborn Chamber of Commerce, The Kiwanis Club of Dearborn, among other organizations. He was also a long-time member of the Downtown Synagogue in Detroit. He is survived by his companion of 36 years, Shelly Brown, his children; and their spouses, Craig A. Newman (Susie), of Scarsdale, New York; Randee Freedman (Paul); of West Bloomfield, Michigan and Carol Ellis (Rick); of Bloomfield Hills, Michigan. He is also survived by his grandchildren; Rachel and Jonathan Newman; Samantha Freedman and husband Evan Mitchell, Jill Freedman; Devin and Jeremy Ellis. He leaves behind his adored companion, Shelly Brown, formerly of Bloomfield Hills, Michigan. Shelly’s children David Brown of New York; Joel (Lorraine) of Palo Alto, California; and Judy (Wayne) Mitnick, of Virginia Beach, Virginia, and her grandchildren, Benjamin and Emily Brown; and Jason and Joshua Mitnick. Buddy and his family were also grateful for his caregivers Roger Morales, April Guajardo, and Gloria Morales. He was predeceased in death by his sister, Patty (Larry) Morrison of Buffalo, New York and Boca Raton, Florida. Buddy was a dear uncle to his sister’s sons, Michael (Mary) Morrison; and Jeffrey (Kyle) Morrison, both of Buffalo, New York.